Hi everyone, it’s Anni again – I’m back to tell you more about life as a research intern with HKDCS. 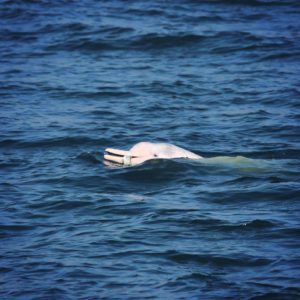 My last blog covered what it’s like to join the team and shadow the researchers as they carry out the line-transect surveys to study Chinese white dolphins and finless porpoises in Hong Kong waters. Now that I’m past the shadowing stage and am actively participating in the research, I’m out on the vessel nearly every day, honing my skills under the guidance of my awesome colleagues, Taison, Vincent, Heyman, Charlotte, Grace and Mandy. As a research intern, you get exposed to every different type of condition at sea – from blue skies and blazing sunshine throwing up glares from the ocean surface, to cold wind blasting you all day, and rain and rough seas tossing you around as you try your hardest to spot white dorsal fins among the crashing white crests of the waves. Some days are beautifully calm and we’re treated to several dolphin or porpoise sightings with interesting behaviours – mothers and calves travelling together, groups of juveniles socialising, adults breaching and spy hopping as we pass them – and some days are wet and miserable with no sightings, which can really sap your morale. However, what you get out of this experience is proportional to what you put into it, so even those days out at sea where we don’t have sightings are an opportunity to build on my knowledge through discussions with the researchers, mining their experiences to add to what I’ve learned, so that there’s never a wasted day. I’ve become much more confident when out on effort, spotting cetaceans, estimating distances, recording data and helping out the team. I’ve also learned a lot more about the animals themselves, and through seeing them so often I have gained a real appreciation of their characteristics and behaviour. 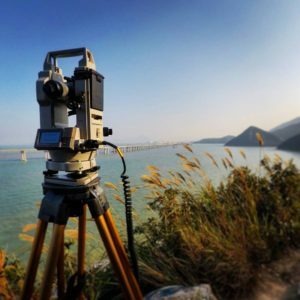 In addition to work out at sea, I have regularly accompanied the team on land-based surveys, where we use a theodolite to track the movements of cetaceans in Hong Kong waters without the disturbance of the research vessel nearby. 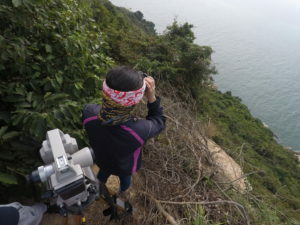 This is particularly fun as it involves getting up early and hiking to the research stations at Shum Wat or Shek Kwu Chau, before getting the chance to see dolphins and porpoises engage in natural behaviours, socializing, feeding, and travelling without our presence to distract them. It’s wonderful to see them from a height and get an idea of their movements in a broader sense, rather than encounter them sporadically from the boat. We calibrate the theodolite and take turns to scan the ocean for cetaceans at predetermined intervals, using the equipment to track their positions while also recording the movement of marine traffic through the survey area in front of us, to better understand the relationship between these animals and the massive number of boats that use their habitat. At Shum Wat, on the western coast of Lantau island, most of the traffic consists of construction boats and small gill-net fishing speedboats. The construction boats are there to work on a huge infrastructure project, the Hong Kong-Zhuhai-Macau Bridge, a 33km combined bridge and tunnel linking Hong Kong to Macau and mainland China, which bisects the key habitat of the Chinese white dolphins and is a source of a great deal of disruption to their lives. 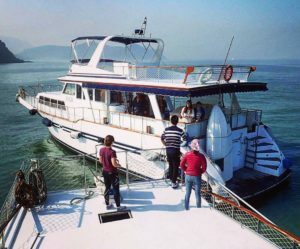 A major project such as this, much like the construction of the Boarding Crossing Facility near Chek Lap Kok airport to the north of Lantau, creates a great many potential problems for marine wildlife nearby, causing habitat loss and degradation, water pollution, acoustic disturbance, and a great deal more vessel traffic than usual. These development projects are just one major threat faced by cetaceans in these waters. The research team tries to establish how far these effects impact the dolphins’ behaviour and it’s rare we see dolphins in areas of intense construction activity. 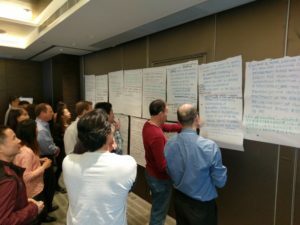 As I build my experience, I have been given an increasingly active role within HKDCS, sometimes helping out in the office to double check and log our research data, sometimes helping with social media campaigns, and even joining the team on a recent protest to defend the rights of wild cetaceans and promote animal welfare. I was also invited to participate in a conservation workshop held by the IUCN Conservation Breeding Specialist Group alongside our project officer, Yuki. This was a really interesting experience as I got a much deeper insight into the conflicting views and interests of all the groups and organisations with a stake in Chinese white dolphin conservation, and learned how many different challenges we face in trying to protect them. Each day there is something new to do, something new to learn, and even on bad-weather days where we’re confined to the office, or during surveys out at sea where we don’t have any sightings, the team helps me to add to my knowledge so that I’m constantly learning. I’m looking forward to telling you more in my next and final blog, where I’ll be summing up my internship and what we can all do to help reduce the threats encountered by cetaceans in Hong Kong waters.